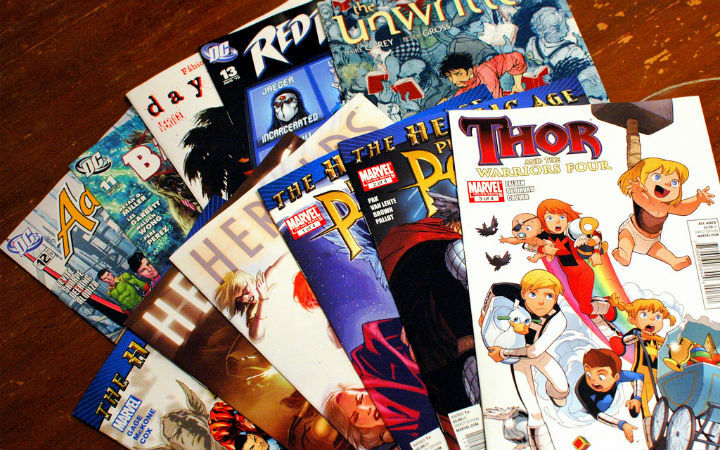 From time to time, I’ll be writing reviews of recently-read comics. I should note there’s plenty of spoilers below. “Life With Archie” is a continuation of the “Archie Marries Betty/Veronica” alternate-futures storyline from last year, and is being published as a magazine-sized comic telling two tales per issue—one in a future where Archie’s married to Veronica, and another where he’s married to Betty. 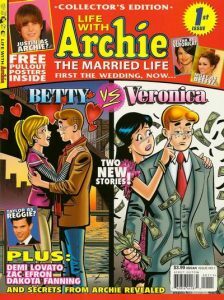 The magazine’s name was taken from the old “Life With Archie” comic series, which was a title used to tell more dramatic-toned stories with the Archie gang. The title is certainly appropriate here, as both stories have a more serious, dramatic tone to them (and is downright bleak in a few parts). Presumably, being adults have given the gang a lot more responsibilities; additionally, not being frozen in time as teenagers forces them to confront and actually resolve the usual recurring Archie themes. For instance, in both stories, we see Moose and Midge finally break up, due to Moose’s trademark short temper. Both stories show Moose seeking anger management help, but Moose gets much more prominence in the Veronica story, where he not only decides to start using his rarely-seen real name (“Marmaduke”; surprised Reggie didn’t make a crack about the comic strip of the same name), but decides to run for mayor of Riverdale. On the more melodramatic side, the Betty story features the two biggest “downers”: Miss Grundy in one future having some sort of unnamed-but-life-endangering ailment (presumably cancer) and Mr. Lodge in both futures. Veronica’s father is portrayed as a much more ruthless businessman than he usually is in the regular comics, with the Betty-future version offering to bribe Archie into divorcing Betty to go back to Veronica and the Veronica-future buying up most of the businesses in Riverdale. The Betty-future Mr. Lodge seems a bit out of character, but I suppose future issues will show more of Lodge’s actions and motivations. And if the above isn’t enough, on top of all of that is a subplot about what happened to Riverdale’s former-teen genius, Dilton Doiley, who in both futures is reported missing after exploring the existence of parallel universes. Said universes are shown in a splash page showing panels of the more oddball stories of Archie’s past, including the Little Archie adventure stories, the Golden Age comics’ stories, and the Archie superheas isro stories (“Pureheart the Powerful,” etc.). The Little Archie tales have been shown as canonical in the regular comics as flashbacks, which is also the case here, as Archie (in one future) runs into a now-adult character from those tales. One fault of the magazine format is that Archie apparently wants to target both older readers (with the stories’ tone) and their usual younger audience, and handled it in a peculiar way. The magazine’s cover features pictures of several current teen pop stars, while the interior features a few quizzes asking readers which stars they’d like to see play the Archie cast in a hypothetical Archie movie. Being past my teen years, I have no idea who half of the teen pop stars listed are, but find the idea of Stephen Colbert playing Mr. Lodge amusing. Finally, I keep mentioning the comic’s magazine format for good reason: I’m still wondering how to store issues of this. I’ll probably have to store them with the also-oversized trade paperbacks I own. Overall, I look forward to seeing where this new magazine-sized comic goes in its next issue. Issue #3 continues the four-part opening storyline of this series, with the identity of who’s behind Quackwerks finally revealed. I admit I was surprised to see who was behind the company, but this issue featured plenty of other surprises as well. One was a brief cameo of Gadget from fellow Disney cartoon “Rescue Rangers.” Another surprise was an explanation for Quackerjack (Darkwing’s Joker-like clown nemesis) being more aggressive than he was in the TV series. Also surprising me was seeing the word “crappy” used in a Disney comic, of all places. While it’s a relatively mild term, I’m surprised to see it get past the editors and make it into print, given Disney’s emphasis on a family-friendly image with their animated productions. I’m looking forward to seeing the fourth issue in this series and how the storyline is wrapped up. The first story in this issue sees a superpowered “fractal” cause old X-Men villain the Blob to transfer his power (of being, well, a blob) to the heroes, causing them to become blob-like. The second story features a tour of the heroes’ SHIELD headquarters, while the third one features Falcon and Reptil accompany Wolverine on a camping trip. While not bad, there’s much to note about this issue. Next issue looks more interesting, as She-Hulk and a few other female heroes show up. This month’s issue features a birthday party at Superman’s Fortress of Solitude for Match, the modern Superboy’s Bizarro clone. 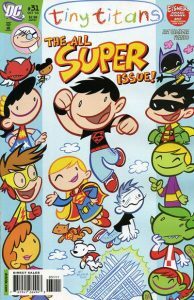 Supergirl, Superboy, and the Super-Pets all show up for the fun, as does Lex Luthor and a few other Superman villains. The usual wacky (but amusing) “Tiny Titans” hijinks ensue. The adult characters get some of the best lines, including how the various Brainiacs describe themselves to the Titans, and Superman’s and Lex’s interactions with each other at the Fortress. As usual, some of the jokes are more amusing if you’ve read (or read about) the mainstream DC Comics they’re referring to, though the last story is based on the Christopher Reeve Superman movies’ versions of Jor-El (complete with white hair and beard), the Phantom Zone (in all its LP album cover-like glory) and the igloo-like Fortress of Solitude.